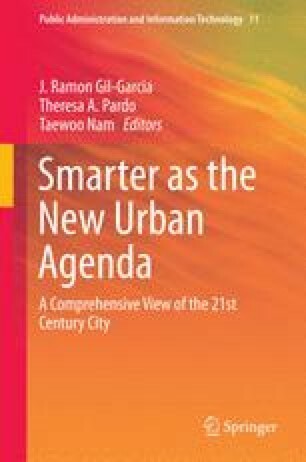 The question of how to make a city or government better by exploiting information and communication infrastructures, referred to as smart city, entails an emerging field of research. Large quantities of data are generated from these infrastructures and infusing these data into the physical infrastructure of a city or government may lead to better services to citizens. Collecting and processing of such data, however, may result in privacy and security issues that should be faced appropriately to create a sustainable approach for smart cities and governments. In this chapter, we focus on data collection through crowdsourcing with smart devices and identify the corresponding security and privacy issues in the context of enabling smart cities and governments. We categorize these issues in four classes. For each class, we identify a number of threats as well as solution directions for these threats. Cameron, K. (2005). The laws of identity. http://www.identityblog.com/?p=352/#lawsofiden_topic3. Accessed 1 Feb 2014. Centric. (2014). http://www.centric.nl/NL/Default/Branches/Lokale-overheid/Burgerschouw. Accessed 11 June 2015. DPPA. (2014). Dutch data protection authority—College Bescherming Persoonsgegevens (2014), Dutch Privacy Protection Act (DPPA)—Wbp-naslag; Found on https://cbpweb.nl/nl/over-privacy/wetten/wbp-naslag. Accessed 11 June 2015. Ganesan, D., & Corner, M. (2011). Crowd sourcing for data collection. http://sensorlab.cs.dartmouth.edu/NSFPervasiveComputingAtScale/pdf/1569392897.pdf. Accessed 26 Feb 2014. OECD. (2013). The OECD privacy framework. http://www.oecd.org/sti/ieconomy/2013-oecd-privacy-guidelines.pdf. Accessed 21 Feb 2014. Taylor, J. (2010). Citizens as public sensors. http://radar.oreilly.com/2010/04/crowdsourcingthe-dpw.html. Accessed 26 Feb 2014. VDSS Vita Data Security Systems. (2014). http://www.vdss.nl/vdss-in-your-network.ashx. Accessed 21 Feb 2014. Zoldan, A. (5 October 2013). More data, more problems: Is big data always right?. http://www.wired.com/insights/2013/05/more-data-more-problems-is-big-data-always-right/. Accessed 11 June 2015.